Helen Griffiths (@GriffithsH_) is with the children’s rights division at Human Rights Watch. Marie is one of dozens of aid workers, many of them volunteers, providing vital services to migrants who depend largely on humanitarian organizations for survival. I followed them over two nights as they distributed bento boxes of food, sleeping bags, blankets, and clothes to migrants who have returned to Calais, still hoping somehow to reach the UK or because they don’t know where else to turn. This year, International Volunteers Day recognizes those who are first responders in crises, who are there to help in desperate times. I have been able to meet many of them since I started tracking the conditions for migrants in France in October 2016. The authorities want to prevent construction of another makeshift settlement in Calais, but migrants have returned. Conditions are desperate. Currently, between 700 and 1000 migrants, most from Eritrea, Ethiopia, and Afghanistan, are living and sleeping out in the open, including between 100 and 200 unaccompanied children. Most of the aid workers in Calais are French or British–but others come from around the world. Some come for short stints, others have been there for months, working for a variety of local and international associations. They prepare and give migrants food, replace confiscated bedding and clothing, and take migrants who have been injured or are sick to the hospital. Others provide legal advice and support. Nongovernmental organizations have played an increasingly crucial role since French authorities closed the so-called “Jungle” camp in Calais in October 2016, and migrants and asylum seekers were taken to reception centers across France. Child and adult migrants have told Human Rights Watch that police routinely spray them with teargas while they sleep or in other situations where they pose no threat, trying to get them to leave the area. Police also regularly spray or confiscate sleeping bags, blankets, clothing, and shoes, and have sprayed food and water. The police harassment extends even to humanitarian workers. They described the systematic nature of police actions: traffic tickets for minor infractions such as insufficient windscreen liquid, phones seized when workers are filming police actions, and frequent checks of identity documents. Checks are not unlawful, of course, but it happens so often that there is little–if any–basis to justify them. One aid worker described how a police officer came up behind her at a distribution and said in a deep voice, “Good evening Ms. Smith. Could I please see your documents?” I have changed her name, of course, to avoid causing her further harassment. Aid workers also described being physically pushed by police, and in mid-July, the police sprayed volunteers when they stopped to help an injured migrant in need of water. When they went to report what happened to them, they felt like they were being interrogated. “It really felt like […] we were criminals,” one told me. Another worker told me that one police officer had asked if she would rather be sprayed or hit with a baton. Under the best conditions, trying to meet the needs of hundreds of desperate migrants is difficult, requiring long hours, skill, dedication, and compassion. In the tense atmosphere of Calais, the police harassment is taking its toll. Some volunteers spoke of the emotional and psychological effect on them. Others have learned to brush it off and say they are far more concerned about the treatment of migrants. From what I saw, though, most humanitarian workers are not about to give up. As I watched them reload a van at midnight, music blaring, they were in good humor. They remain determined to provide the crucial assistance migrants need to survive, despite the obstacles. They need support. 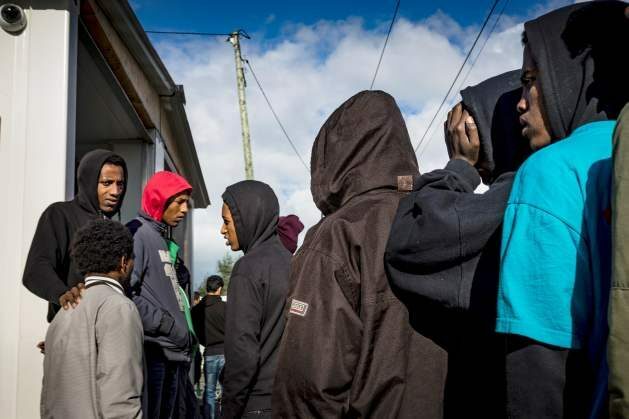 In October, an independent inquiry by the French administration and security forces’ internal investigations department found convincing evidence that police abused migrants in Calais. One of the recommendations is for the local authorities and police officers to meet regularly with aid organizations to make sure that migrants get the help they need. That is especially important now with winter weather setting in. And that includes providing full information about services available and the asylum process in France. I’m still in touch with Marie, who, along with others, works tirelessly despite the ongoing police harassment. Today, everyone should celebrate the work these brave people are doing day after day in such difficult conditions.